Sorry, folks! I kept you waiting for so many days…….actually I was really busy with my studies……..but now I won’t allow it to overcome my passion to write! Let me tell you about my recent trip to New Delhi. It’s not recent, really, as I had been to the place in the month of June, but the artistic impressions of the city still remain vivid in my mind. 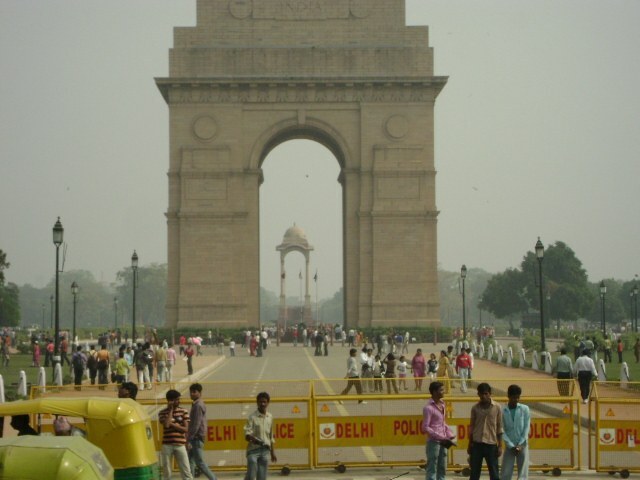 The historic city of Delhi or New Delhi has seen many a great rise and fall of kings and queens, emperors and empires. Well now we stay in a democratic country, so we don’t have kings or kingdoms anymore; but they have left their monuments for us perhaps as their legacy. They may be dead, but their memories live on. Some months back I used to watch a TV program on DD National titled as the Forts of India. I’d really like to thank to Indian Government for producing such an educational show. It used to show about all the Mughal as well as the Rajput forts. Some of the Rajput forts even have their descendants residing there. I had been really fired up by this show as I had been after seeing Maharana Pratap, so when Daddy announced that we were going to visit the glorious Indian capital, my excitement knew no bounds. The next day, we started at 7.30 a.m. The traffic laws had been made stricter because just a day back then Rural Minister Gopinath Munde had expired due to a car accident and doctors had written in his biopsy report that he could have been alive if he had his seat belt on. So we back seated passengers were obliged to put on the seat belts. We had completely left on our driver to guide us around the place. So he was doing all the directing part. I quite do not remember the dates and order of our visits, so I’m presenting here a random account. We first halted near the famous Birla Temple. I wish we had clean temples back in Orissa here! It is a beautiful temple and has a very peaceful atmosphere. It is large and has white marble flooring and has been maintained nicely even though it is so old. 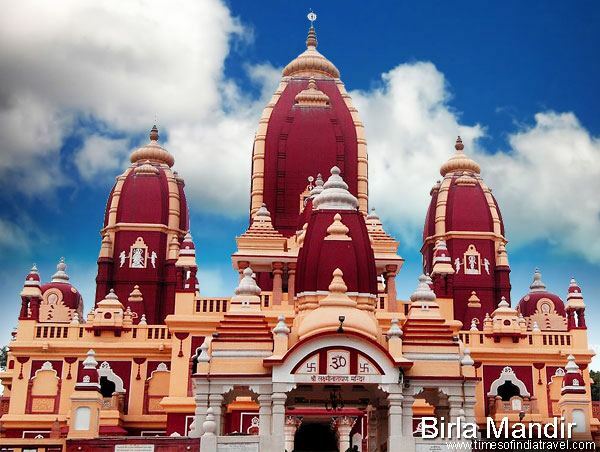 The sound of the temple bells would fill your hearts with a sense of tranquility. Our next stop was at the National History Museum. They provide you a free guide. My God, the museum is huge! But we were rushing like a Superfast express. We missed out everything. The history museum showcases Indian history from the beginning of the Harrapan and Mohenjo Daro Civilisation. I do not know where it ends. For a history fanatic like me, it would require a week’s time to see all the items on display and take notes. We went through the civilizations, then the Mauryan, Gupta dynasties, birth and growth of Buddhism and Jainism………and then daddy was such in a hurry that we had to miss out the other things. I still managed to take a quick peek on the Mughal miniature paintings. If you are a CBSE student, then you must have studied history in 6th and 7th standard. All the pictures in the books have been taken from the Museum’s display only. We need more Indian historians in our country. It is really a shame that Indian World Heritage sites have been mostly studied and deciphered by foreign historians. Well, what can I do. There isn’t any other job here except Engineering. All hail Science! Our guide, Mrs Neena Jain, was a sweet old lady and was explaining us like a professor. She had the light and the feelings in her eyes while speaking about our history. Since we were visiting from Odisha, she showed us the Sun God idol preserved carefully. The Konark Sun Temple does not house it. It was really a proud moment! She reminded me of my dearest Bio teacher Reena Madam. 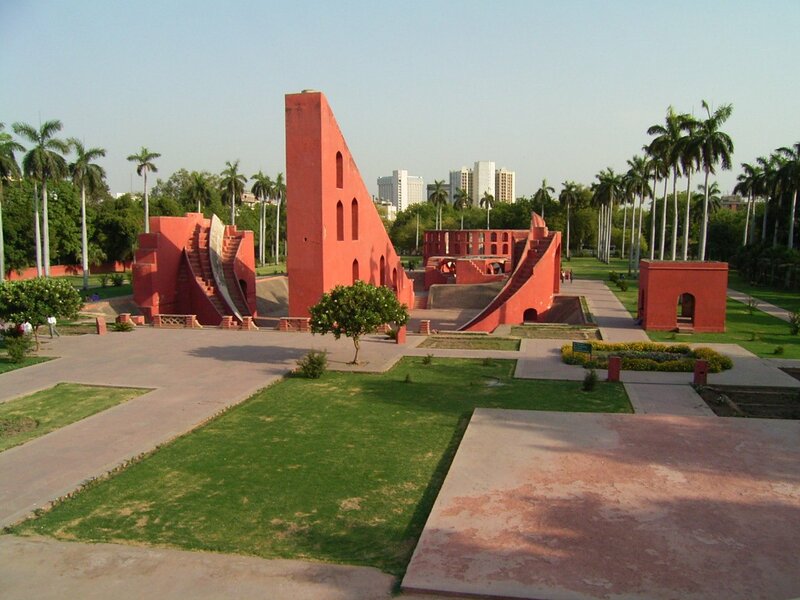 Bidding a sad adieu to the place, we moved on our journey further and spent a short time at Jantar Mantar. Then we stumbled across one of the oldest monument of Delhi, the Qutub Minar. It had been built in the year 1193 by Qutubuddin Aibak. He had built it for his daughter. Standing at a height of 72.5 meters, it is the second highest minar in the world. The minar has suffered a lot of damages due to natural calamities like earthquakes. An archway has already broken from the top. was repaired by Iltutmish and many other emperors who ruled next. 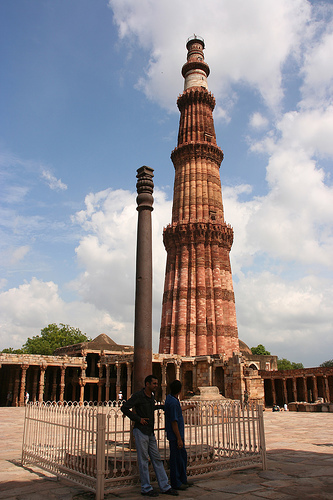 The famous Iron pillar- the metallurgical marvel of India stands in front of the Qutub Minar. It belongs to the Gupta dynasty and it is always wrongly referred to as the Ashokan pillar due to architectural similarities between its style and that from the Ashokan era. When you enter the place, you can see the tombs of Qutubuddin Aibak and his successor Iltutmish on the right side. There is a marked difference between the tombs of Mughal Emperors and the Delhi Sultans. The tombs of the Delhi Sultans are not covered by arched forts like that of the Mughals. They are lying in a dilapidated state. Now let us get a little bit of patriotic as well as historic. We had paid a visit to the Rashtrapati Bhavan, Amar Jawan Jyoti and the India Gate. 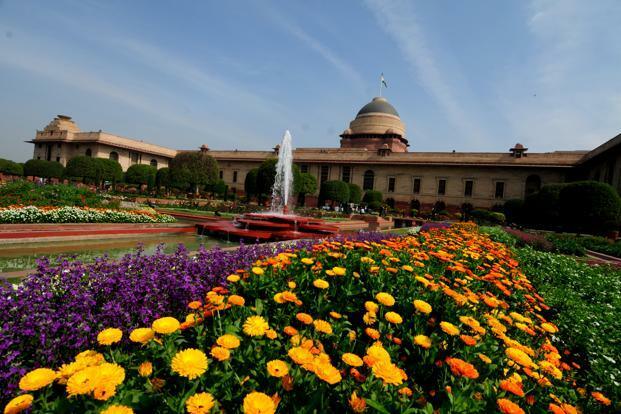 Rashtrapati Bhavan is the home of the President of India. Amar Jyoti Jawan is a flame which is kept burning continuously in the memory of the soldiers who have died fighting for our motherland. I salute to all those brave hearts who have died fighting for our country, and are still fighting for our betterment and want to give us justice. I could not quite understand the importance of visiting Lotus temple. We went and sat inside. That’s it. It is a peaceful place where seats have been made up of marble. The room is so cool and it almost lulls you to sleep :p But I must admit that the place has been very well constructed. An architectural marvel indeed. Doesn’t it remind you of the famous Opera House at Sydney? Here I would like to distinguish between Rajput forts and Mughal forts. During the Mughal reign, there were a lot of invaders who were thirsty for the royal blood, hence for extra protection, the forts have thick and large walls, which go missing in the forts at Madhya Pradesh. Take, for example, the Gwalior fort. The ruling Sindhiyas had made Gwalior a princely state during the British rule. Hence they had no requirement of such huge walls for security. The windows of both types of forts also show marked differences. But there are some similarities too. The minars are a mixture of both Islamic and Rajput architectures. I need to see some Rajput forts to give an extensive report on this. Pooh! Enough of this Delhi talk…….now let’s move our eyes on to Agra! The tomb is a real huge one. 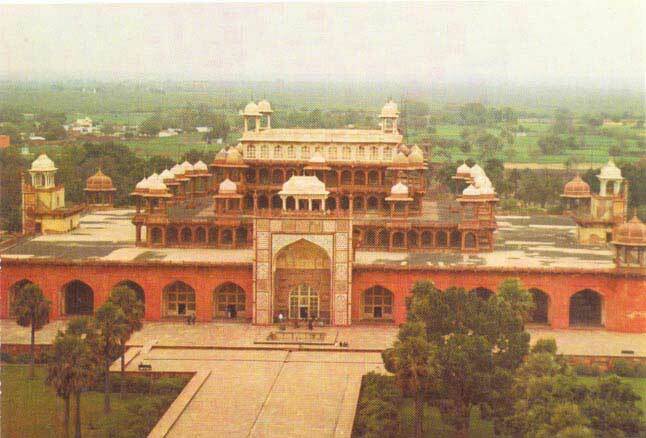 It had been built by Emperor Jahangir in the memory of his father. The tomb has no lighting system like that of the Taj Mahal hence it is very dark. But it is really cool inside. Just to think, we are alive and we are being troubled by the scorching heat, on the contrary Jalal is dead and he is sleeping in a permanent A/C room like condition. Now I’m real jealous of him. The fort has a ground where some deer are residing. It is indeed a great way to utilize a place and save two diminishing things together: flora, fauna and history. Agra Fort, here I am! 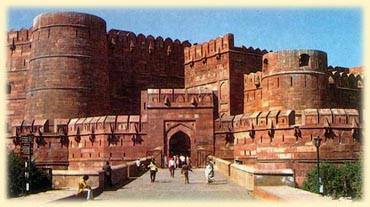 Agra Fort had been built by Emperor Akbar when he shifted his base from Delhi to Agra for security concerns. It is smaller than The Red Fort. You can see the Taj Mahal from here. Shah Jahan had been under home arrest at Agra Fort and he died seeing his creation from a distance. It has a small room where it is said that Shan Jahan offered his daily prayers. Most of the rooms were locked but I chanced to see one open. The rooms are small and the walls of the room have carvings where decorative items would have been put once, but now they are absolutely empty. 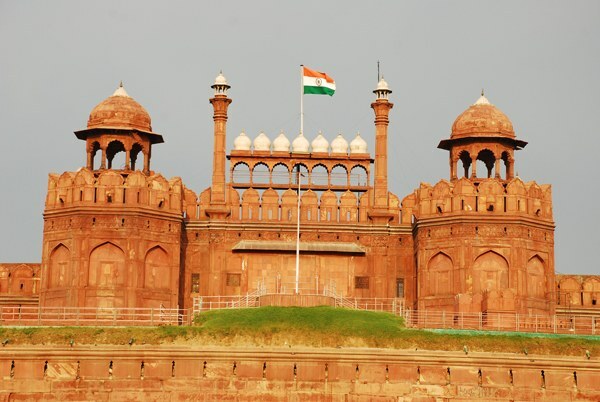 The Britishers have taken away most of them, mostly from the Red Fort, where the British soldiers resided. They had remodeled the place, destroying the original designs. Finally the time has come for me to introduce you to the Taj Mahal…even though the 7th wonder of the world needs no formal introduction. It was built by Emperor Shah Jahan in the memory of his youngest wife Arjumand Banu Begum or Mumtaz Mahal. Mumtaz Mahal had bore 14 children of Shah Jahan and had died during childbirth just at the age of 38. She had made him promise not to marry any other begum after her demise. People say the Empress Consort was prettier than the moon, and the Emperor could never resist her temptation. 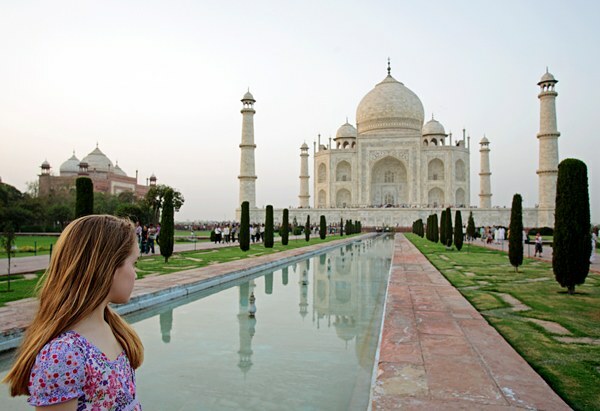 The Taj has been completely been built out of pure white marble. It took 16 years to build it. I got goose bumps when I reached the scene. History can get on to your nerves at that place. You can almost feel the romance……..but not in the scorching heat. Wikipedia even tells you that Shah Jahan had cut the hands of his 22000 workers, who had come all the way from Persia to build this magnificent beauty; but it is not true. We had a guide with us from the Govt. Tourism Dept., who said that this is completely a hoax and no one knows why this has become widespread and strong. According to him, the workers were allowed to build rooms for them to stay. During the construction of the Taj, the workers felt that it was necessary to build a mosque nearby so that they could offer their daily prayers. Hence, a mosque was built. To maintain equilibrium for the structure, a guest house was made on the opposite side. It is difficult to distinguish between them, as both have been made as Xerox copies to each other. Shah Jahan gave the workers huge amount of money and gifts. Some of the descendants of the workers still stay in the neighboring areas and do the same work their forefathers did: crafting of stones. We needed to wear a special kind of covering on our shoes so that the tomb would not get dirty. The central part of the tomb has got a mausoleum where both the bodies of Mumtaz Mahal and Shah Jahan have been placed in separate coffins. Actually the one that we see is fake. The real bodies are below the fake ones, where once people were allowed to go, but now it has been closed. Shah Jahan wanted to make his own tomb too. So he had started making the Black Taj, which overlooked the White Taj over the river Yamuna. But then Aurangazeb had already come into power, and he had ordered to put his father at house arrest. Hence, Shah Jahan’s dream could never be fulfilled. On the top of that, Aurangazeb had brutally killed Dara Shikoh, Shah Jahan’s eldest son who was worthy of the throne, and his family. Dara Shukoh was the emperor’s most beloved son. In this grief, Shah Jahan’s health had started to fail, and even under the intense care of his favorite daughter Princess Jahanara, he could not be saved. His last wish was to be buried near his beloved Mumtaz, who had died years ago, but their love has not died. It will exist as long as the Taj will, and I believe it is for ever. On full moon nights, when the moonlight falls on the Taj, you can see inside it from outside at a distance. In other words, the monument is translucent. Fees: Rs 500-/- to see this mystery being unrevealed. When the construction of the Taj Mahal ended, Shah Jahan had distributed a kind of sweet called Panchi Petha, which is native to Agra to the whole public, to express his happiness. We were so much impressed by the musings of the guide that we purchased a packet from Bikanerwalas. I would like to give you a free piece of advice: Never ever eat a Panchi Petha. They are even made up of pumpkin. Gross! The Taj mahal has been beautifully maintained, but the pollution from the refineries at Mathura has not spared it. This splendor has started turning yellow in color due to the reaction of Calcium Carbonate [white marble] with the oxides of nitrogen and sulphur. Acid rain also adds fire to it. We need to save our heritage. After all, its our legacy. My visit to Delhi and Agra was not a piece of cake. In the middle of the summer season, the temperature varied from 45 to 47 degree Celsius. I had nearly fainted while walking back from the Taj Mahal. The climate of Delhi is quite dry. We were continuously making up for our lost body fluids by drinking water, lemon juice, cola, cucumber and ice creams. Life in Delhi is harsh. The traffic is so intense and the place is so heavily populated, that you feel like a lost grain of salt in a heap of sand. The expense on top of that is heart rendering. We could only manage to eat Thalis. Food consisted of only paneer, rice, dal, dahi and a salad. Back at home, we have so many veggies. I have always created a fuss when mummy cooks them. There I realized I have been so lucky to get proper food to eat. The result of AIPMT was declared the day before our return and my mood had become completely off. I would like to extend my heartfelt greetings towards the Indian Government and UNESCO for the excellent work they have undertaken towards the protection of our glorious cultural heritage. Also, tourism is a booming industry and it provides employment for thousands of people. Foreign tourists love coming to India because for them it is a cheaper destination than other countries. I hope that this good work will always continue and will extend towards my state as well. Odisha has a plethora of temples, mostly belonging to the time of 9th-12th century. But they fail to get recognition due to the lack of government funds and they always remain unclean. I hope that my article sends a message to all the people of Odisha so that we all can work together to protect our Odia culture. Good or bad memories…..memories are memories; and they lie in your brain but never clog it, when you think about the past time, they are magically revived instantly, placing a smile on your lips and tears in your eyes. I wish I could go back to Delhi again. I have missed out so many places of visit. My dream list has expanded: now I want to go on a historical tour of India. I know that will cost me a lot, but I will. This dream has to be fulfilled. And I hope that someday it will. CONFESSION: All the theories which I have written are purely based upon my knowledge with due reference to my history textbooks, Wikipedia and Agra Tourism Department. No fact should be challenged publicly as it is just a travel memoir. However, I’ve tried to put my sincere efforts in collecting real details as far as possible. I have provided numerous links for further studies. This entry was posted in Incredible India and tagged Agra, Agra Fort, AIPMT, Akbar, Akbar's tomb, Amar Jyoti Jawan, Ashoka, Aurangazeb, Bhubaneswar, Birla Temple, Black Taj, Britishers, CBSE, Delhi Sultanate, Gopinath Munde, Gupta Dynasty, Gwalior, Illtutmish, India gate, Jahanara, Jahangir, Jantar Mantar, Jodhaa Akbar, Konark Sun Temple, Lotus Temple, Mauryan Empire, Mughal empire, Mumtaz Mahal, National Museum of Natural History, New Delhi, Odisha Culture, Opera House, Panchi Petha, Qutub Minar, Qutubuddin Aibak, Rashtrapati Bhavan, Red Fort, Shah Jahan, Sydney, taj Mahal, Unesco, Wikipedia, World Heritage sites, Yamuna. Bookmark the permalink. Gosh! I have stayed in delhi fr half a decade and haven’t had this historian in me rising… too good an article. Meticulous! Marvelous! 3. Glad you are back. SO stay on!! Now I think you have chosen a wrong profession but still you can be an engineer and a very good history professor.Your in depth knowledge in biology can also make you a very good bio teacher.I wish you all success in life.May God bless you so that you achieve every thing in life . I do understand your potential. What I want is, what ever you do try to give your best to that. About nishi , teach her how to effectively use the time and make her read news paper snd other books. Delhi is the capital of our India. It has many histories. Thanks for sharing this post as many things got to know about Delhi. Anusia I have tried to cover my whole journey. I wish I could have seen other places as well…. I am happy that I could give you important info 🙂 Thanks for visiting my blog…keep coming! Bahut Khub Delhi Darshan. I had visited all this place many of times, and enjoyed. You know you missed one of my favorite place, The Akshar Dham Temple and its devotional/water/spiritual musical show. Well you have written “Our final destination at Delhi was the place from where the Prime Minister hoists our National Flag every Republic Day.” I think here you need to make some changes. It’s Independence day not republic day. My gosh! !….its a fab article..really..great job.. Thank you dear! Your blog is nice as well!